Matsutake regulations as detailed in "The Oregonian"
We were delighted to find Terry Richard's article in the August 31, 2014 edition of The Oregonian newspaper detailing the matsutake regulations in our beaver state. 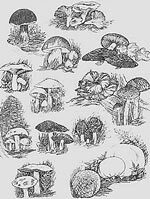 This is the kind of information that's really useful for everyone, whether you're picking for your pot or for the mushroom buyer down the street. 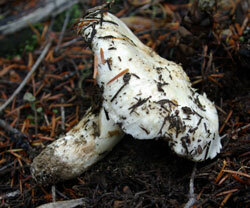 Don't confuse Matsutake and Amanita! July brought rains to Port Orford, and with them came a few of the first of the season's edible mushrooms ... right on schedule. July's never a banner month for chanterelles, but it's a hint of what is to come later in the year. These early mushrooms soon dehydrate themselves, and are frequently small, even stunted due to the lack of abundant moisture. Now, it's the first of September, and we're holding our breath, waiting for some drenching rains to quench the thirst of all that inhibits the forest floor. While we waited in August for the rains, we set a course for points NE, flying to Boston, renting a car and driving up into New England and into Canada's Maritime Provinces: New Brunswick, Prince Edward Island and Nova Scotia. As always, we were on the lookout for mushrooms. Acadia National Park, one of our first destinations, didn't let us down. We found amanita in several pullouts when driving along the park's circular route. Many stops in Canada similarly gifted us with a glimpse of the richness and diversity of the landscape. There was much to see and do, but the most spectacular encounter in the Maritimes wasn't fungal; in New Brunswick, we were fortunate enough to see the world's most extreme tides at the Bay of Fundy, where the swing between high and low tide is often 50 feet! We couldn't have timed our visit more perfectly, arriving on the eve of the Perigee Moon, when the full moon coincides with the moon's closest point to earth in its orbit. This produces not only an extreme tide, but spectacular moon watching, and we saw it at both the high and the low tides. Wow! Yet, it was back in the States at Vermont's Walden Pond State Reservation where we found our largest fungal fruiting: a lovely display of suillis and boletes bursting through the duff. Henry David Thoreau would no doubt be taken aback by what his beloved pond looks like today (although a lot of it is preserved in its natural state), but we'd like to think he'd be pleased that those who followed in his footsteps still were interested in the natural bounty to be found there. 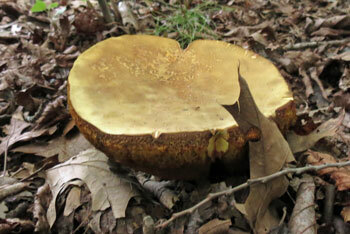 How delightful that Walden Pond gifted us with fungi! Would have made Henry David Thoreau proud!